The High Court today began hearings into an appeal filed by ex-defence minister Mohamed Nazim over a 11-year-jail term on weapons smuggling charges. 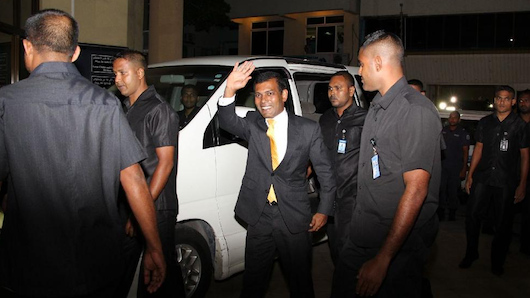 Nazim, who maintains he was framed by rogue police officers, highlighted several lapses in due process, including the criminal court’s refusal to call defence witnesses, discrepancies in testimony by anonymous police officers, and the police’s alleged failure to follow the law and standard procedures in the midnight raid on Nazim’s apartment. The retired colonel was charged with smuggling weapons after masked police officers said they had discovered a pistol, three bullets, and a pen drive with documents detailing a plot to assassinate President Abdulla Yameen, inside a bedside drawer in Nazim’s apartment on January 18. The rushed trial has been widely criticised for apparent lack of due process. Five high court judges are presiding over Nazim’s appeal. Presiding Judge Abdul Ganee Mohamed said hearings will be held daily, as agreed by Nazim’s lawyers and the Prosecutor General’s Office. Hearings are expected to conclude within the week and a verdict is expected soon. 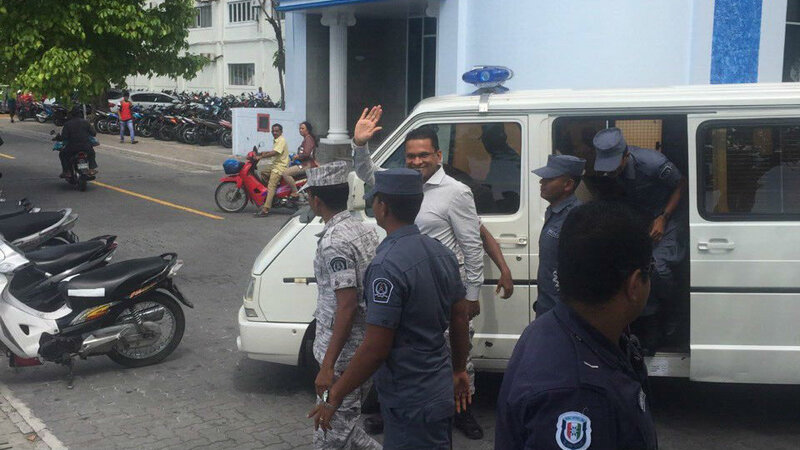 Nazim was sentenced to jail on March 27. He claims a team of Specialist Operations (SO) police officers had planted the weapons at his apartment on the orders of tourism minister Ahmed Adeeb. Adeeb and Nazim had fallen out over the tourism minister’s alleged use of police officers to commit criminal activities including the cutting down of all of Malé City’s Areca palms in October last year, Nazim has alleged. Adeeb has denied Nazim’s claims. At today’s hearing, Nazim’s lawyers said the criminal court issued search warrant was invalid as police officers had provided false information to obtain it. The court warrant was issued based on information provided by a senior officer and not based on intelligence reports, lawyers said. While some police officers had said they did not know which floor they were to search for the weapons, another officer had testified in court that they were only instructed to search the eight floor of the apartment building, lawyers said. The court warrant had authorized a search of the entire building. The discrepancies in police testimony on the floor to be searched showed they had lied to obtain the warrant and also demonstrated that the police were aware they would be searching the ex-defence minister’s apartment, lawyers said. Nazim’s lawyers also said that criminal court judges prevented them from questioning the validity of the court warrant. Police officers did not follow standard procedures during the raid on the apartment, lawyers said. A copy of the warrant was not provided to Nazim, and officers spent time unsupervised in Nazim’s bedroom before the search, they said. Charges against Afaaf Abdul Majeed were dropped at the first hearing, claiming evidence from the pen drive indicated she had no connection to the weapons. Lawyers argued charges should have been dropped against Nazim, too, claiming a police officer, who had conducted the analysis of the documents found in the pen drive, had said there was no evidence to suggest the weapons belonged to Nazim. The media was barred from the hearing in which the data analysis expert had testified. Lawyers said they were blocked from mounting a defence because judges refused to call defence witnesses and because several key police witnesses were anonymous. Noting discrepancies in testimony provided by police officers, Nazim’s lawyers accused them of lying under oath. Lawyers also accused public prosecutors of coaching witnesses, as they had admitted to meeting with witnesses before they appeared in court. The criminal court prevented the ex-defence minister from making an independent analysis of the weapons and from collecting defence statements. Public prosecutors will respond to Nazim’s appeal tomorrow. He was tried by the three judges who oversaw Nazim’s trial. The former president was temporarily transferred to house arrest today. The prosecutor general’s (PG) office is awaiting a case report from the criminal court to decide on appealing the acquittal of defence minister Moosa Ali Jaleel on terrorism charges. The 10-day appeal period expired yesterday, but the PG media officer Hisham Wajeeh told Minivan News today that the High Court could accept appeals after the deadline if there is a valid reason. “We only got the verdict. We couldn’t make a decision on the appeal without studying the points noted in the trial, which will be in the summary report,” he said. The PG office will appeal if it believed there are valid grounds after studying the report, he said. Five senior state officials were charged with terrorism and tried separately over the detention of criminal court chief judge Abdulla Mohamed in January 2012. The court said there was insufficient evidence to prove the involvement of Jaleel, who was then-chief of defence forces. Former president Mohamed Nasheed was meanwhile found guilty of terrorism last month and sentenced to 13 years in prison. Then-defence minister Tholhath Ibrahim was also sentenced to 10 years in jail over the judge’s arrest. 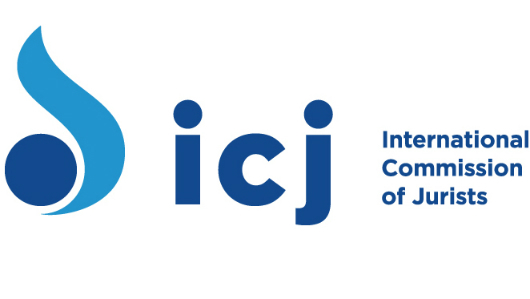 The conviction of former President Mohamed Nasheed on terrorism charges was “grossly unfair” and highlighted “judicial politicisation,” the International Commission of Jurists (ICJ) have said in a press release today. The opposition leader was sentenced to 13 years in prison on March 13 over the “kidnapping or abduction” by the military of Criminal Court Chief Judge Abdulla Mohamed in January 2012. “The Maldivian judiciary’s independence has been compromised for years by serious pressure from the government, and this grossly unfair conviction highlights the numerous problems with the politicization of the judiciary in the country,” said Sam Zarifi, the ICJ’s Regional Director for Asia and the Pacific. Among the violations listed by the ICJ included two of the three judges presiding over the trial having testified in the 2012 investigation, denial of legal representation for Nasheed during the first hearing on February 23, and the denial to the defence team of both full access to evidence and state witnesses and the opportunity to consult with Nasheed. Moreover, ICJ noted that the court denied Nasheed the opportunity to seek new representation after his lawyers quit in protest of the court’s refusal to grant sufficient time to mount a defence. “The defence was also denied the opportunity to call its own witnesses,” the press release added. “If you study this case, from the beginning to the end, it is clear the charges are not politically motivated,” Muaz insisted. “The government calls on its international partners to engage constructively, based on mutual respect and dialogue in consolidating and strengthening democratic values and institutions in the country,” read a statement issued by the President’s Office. “In addition, the court has still not released to Mr. Nasheed’s defense team the full court record required to prepare and present an effective appeal within this accelerated timeframe,” the press release added. “Recent events reflect a justice system that still remains deeply politicised along the same lines of entrenched political loyalties that pre-date the transition period,” said Zarifi. “The Maldives must also take effective measures to ensure that such violations do not reoccur in this or future cases,” the ICJ said. The government has invited experts from the United Nations Secretary General, the Commonwealth, Office of the High Commissioner for Human Rights and the European Union (EU) to observe the appeal hearings of former President Mohamed Nasheed. Nasheed was found guilty of terrorism and sentenced to 13 years in prison on March 13 over the military’s detention of Criminal Court Chief Judge Abdulla Mohamed in January 2012. “On behalf of the Government the invitation was extended by the Minister of Foreign Affairs H.E. Dunya Maumoon,” read a press statement from the foreign ministry. Hundreds of opposition Maldivian Democratic Party (MDP) supporters today urged Criminal Court Chief Judge Abdulla Mohamed to release a transcript of court proceedings necessary for the appeal of former President Mohamed Nasheed’s 13-year jail sentence. In a letter to Judge Abdulla, over a hundred signatories noted the ten-day appeal period would expire on Monday, March 23, and urged the court to release court proceedings without further delay. The High Court subsequently informed Nasheed’s lawyers that the appeal period would expire on March 26 (Thursday). The UN High Commissioner for Human Rights Zeid Ra’ad Al Hussein and the UN Special Rapporteur on Independence of Lawyers and Judges Gabriela Knaul last week urged the Maldives to guarantee that Nasheed’s appeal would respect the most stringent fair trial standards and observe due process. Speaking to Minivan News today, Nasheed’s lawyer, Hassan Latheef, said the Criminal Court had only provided a summary of the judgment, and said the full court proceedings were necessary for a strong appeal. Latheef said the High Court’s decision to discount weekends in the new appeal period demonstrated the judiciary’s extraordinary treatment of Nasheed’s case. The Supreme Court in January issued new regulations reducing the maximum period of appeal from 90 days to ten days. On March 5, in an announcement online, the Supreme Court said the ten day appeal did not include weekends or the day the verdict was issued. The MDP has previously accused the Criminal Court of deliberately thwarting Nasheed’s attempts to launch an appeal. Meanwhile, the legal team in a statement last week noted the Criminal Court contravened the Supreme Court’s appeal regulations by providing the judgment summary a week late. Eva, MDP MP Ahmed Falah and Independent MP Ahmed Mahloof led the group delivering the letters to the Criminal Court. The crowd set out from the MDP offices towards the Criminal Court at noon, but were blocked at the President’s Office and the Supreme Court. 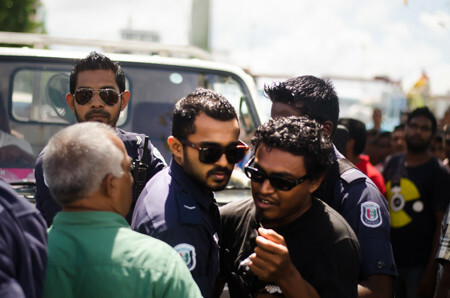 Police detained Falah in a scuffle near the President’s Office. He was handcuffed and taken to the Police HQ, but was immediately released. When the group reached the Criminal Court, they were pushed behind barricades in a narrow alleyway and police escorted each letter bearer separately into the Justice Building. Shimla Adam, 45, pointed out Nasheed’s legal team did not have enough time to review court proceedings and lodge an appeal even if the Criminal Court provided the report today. “I do not think President Nasheed will get any justice. I have no hope of things getting better in this country,” she said. President Abdulla Yameen has previously called on all parties to respect the Criminal Court’s verdict, stating Nasheed had “a constitutionally guaranteed right of appeal” to challenge his conviction on terrorism charges at the High Court. UN rights experts Knaul and Zeid have called on the Maldives to allow international observers including jurists to attend Nasheed’s appeal hearings. This article was amended to include a statement by the Supreme Court which said the appeal deadline does not include weekends or the day a verdict is issued. Former President Mohamed Nasheed’s lawyers today decried the Criminal Court’s continued failure to provide court proceedings into the opposition leader’s terrorism trial, with only two days remaining before the appeal period expires. The Criminal Court only today released a judgment summary, which lawyers say is not enough to build an appeal. Without the full transcripts of court proceedings, lawyers would not be able to determine if the three judge panel had considered fully witness testimony and defence arguments in their verdict, a statement issued today said. The opposition leader was convicted of terrorism and sentenced to 13 years in jail on March 13. According to new rules enacted prior to Nasheed’s trial, lawyers have 10 days to file their appeal. A signed copy of the judgment summary was provided just before 3:00pm today, although the Supreme Court issued rules require judges to provide the summary at the end of the trial. The appeal deadline is believed to expire on Sunday, March 22. Asked if the ten-day appeal period included weekends, a Criminal Court spokesperson said he would have to check the new rules. “These are untested rules. So we will file the appeal by Sunday, March 22,” Ahmed said. The conviction of the opposition leader on terrorism charges relates to the military detention of Criminal Court Chief Judge Abdulla Mohamed in January 2012. He urged the former president be given adequate time to prepare and present his defence during the appeal process. President Abdulla Yameen meanwhile called on all parties to respect the Criminal Court’s verdict. In a statement released by the President’s Office on Sunday (March 15), President Yameen noted that the opposition leader has “a constitutionally guaranteed right of appeal” to challenge his conviction on terrorism charges at the High Court. Correction: This article previously stated the Criminal Court had issued court proceedings. This is incorrect. The court had only provided a judgment summary. The High Court today dismissed former President Mohamed Nasheed’s appeal challenging the legality of the Criminal Court’s February 22 arrest warrant, after the opposition leader asked for an open hearing. The High Court denied Nasheed’s request, claiming neither members of the public nor journalists were allowed to observe appeal hearings. The appellate court dismissed the case after the former president reportedly refused to enter the courtroom. Hisaan Hussain from Nasheed’s legal team told reporters that the High Court had decided in a circular to hold closed hearings for appeals concerning arrest warrants. She argued that the decision was in violation of Article 42 of the Constitution and Article 71 of the Judicature Act as circulars did not have the force of either laws or regulations that derived its authority from an act of parliament. Nasheed’s lawyer, Hassan Latheef, told Minivan News that the legal team has decided to appeal the High Court’s decision at the Supreme Court. Article 42 of the Constitution states that “trials of any matter shall be held publicly” while the presiding judge could exclude the public in the interest of public morals, order and national security, or where juveniles or the victim of the crime requires, and in cases where public interest would prejudice justice. 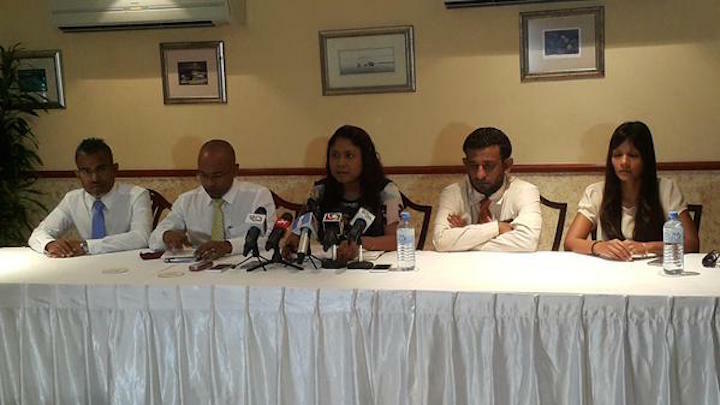 The opposition Maldivian Democratic Party (MDP) subsequently released a statement contending that the High Court did not have the legal authority to bar members of the public and journalists from observing hearings. 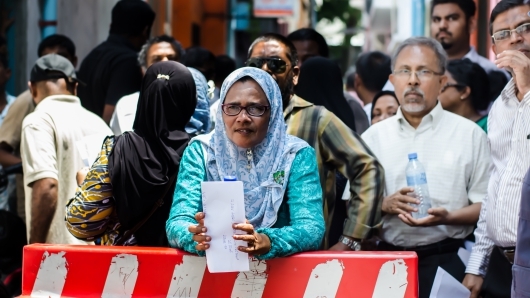 “By carrying out court proceedings in a manner that prevents constitutional rights and protection, the High Court is losing public trust, with the appeal process losing its meaning,” the MDP said. Following the Criminal Court convicting Nasheed on terrorism charges on Friday night (March 13), Latheef said the legal team has requested the court report in order to appeal the 13-year prison sentence at the High Court within ten days. A Supreme Court circular in January shortened the maximum appeal period from 90 days to ten days, claiming it would ensure the right to appeal in a timely manner. “The Criminal Court informed us that the report will be provided in seven to 14 days,” said Latheef, noting that it would leave the defence team two days to prepare for the appeal hearing. “Every aspect of this trial is very different from normal procedures followed by the courts,” he said. President’s Office Spokesperson Ibrahim Muaz said yesterday that the government would ensure Nasheed’s right to appeal. “I believe the Criminal Court would have afforded due process in the conduct of Nasheed’s trial. If you study this case, from the beginning to the end, it is clear the charges are not politically motivated,” Muaz insisted. Nasheed was brought from the Dhoonidhoo detention centre to Malé around 1:30pm. Hundreds of protesters were gathered near the High Court building, demanding the former president’s immediate release. 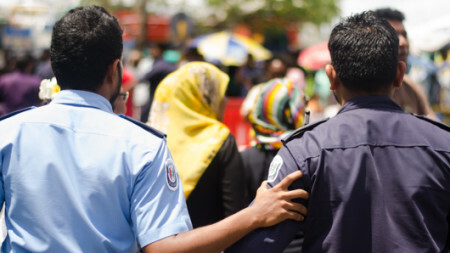 Police informed Minivan News that four individuals were arrested from the protest for allegedly obstructing police duties and for trying to harm police officers. Minivan News journalists observed police officers using pepper spray indiscriminately while making the arrests. Throughout the Criminal Court trial, Nasheed maintained that he had been deprived of basic constitutional rights, including the right to legal counsel, right to appeal, and the right to be provided adequate time to prepare a defence. Judges also refused to hear defence witnesses claiming they did not appear to negate the prosecution’s case. Delivering the guilty verdict Friday night, Judge Abdulla Didi said the prosecution’s evidence proved beyond reasonable doubt that Nasheed as commander-in-chief ordered the arrest or “forceful abduction” of Criminal Court Chief Judge Abdulla Mohamed in January 2012. The former president was arrested on February 22 after Prosecutor General Muhthaz Muhsin personally sought an arrest warrant from the Criminal Court ahead of the surprise terrorism trial.